Kurdish YPG forces today captured the Syrian town of Tel Abyad on the Turkish border, striking a major blow to ISIL insurgents who had held the town and its border crossing for more than a year, The New York Times reported. Kurdish commanders took control of the town on Tuesday. They are now clearing booby-traps and mines planted by ISIL throughout the city. ISIL had used Tel Abyad border crossing to smuggle in fighters and materiel into its Syrian stronghold of Raqqa. YPG, which in January led the liberation of Kobane, and their Arab allies, brought down the black flag of ISIL and raised their own flag in the city center. Capturing the town now allows the Syrian Kurds to link different parts of predominantly Kurdish territories in northern Syria, a major step in creating an autonomous Kurdish regional government in the country. 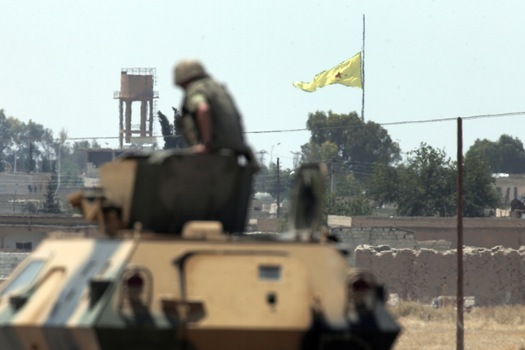 It was unclear if Turkey would allow YPG to use the Tel Abyad border crossing to bring in badly needed supplies. People’s Protection Units (YPG) is an offshoot of Turkey's Kurdish PKK, which has been battling Turkish forces during a 30-year insurgency. YPG's advance toward Tel Abyad last week was facilitated by intense U.S.-led airstrikes against ISIL positions in and around the city.